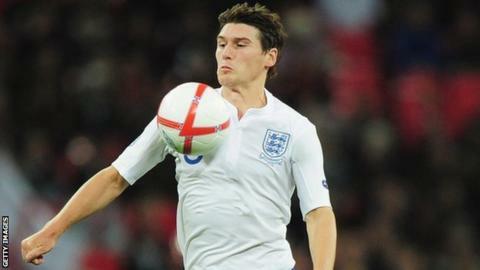 Manchester City's Gareth Barry has set his sights on returning to the England squad after again being overlooked. The midfielder, who missed Euro 2012 through injury, has missed the three matches since the tournament. Barry was also omitted from the squad to face San Marino and Poland in the upcoming World Cup qualifiers. "I am obviously disappointed because I want to play for my country but I am not ready to retire yet, and will just keep working hard", Barry said. Barry, 31, who has 53 caps, last played in the 1-0 win over Norway in May, in what was Roy Hodgson's first game in charge. But he was then forced out of contention for a place at Euro 2012 through an abdominal injury. Barry, who has made three league appearances this season for City, played 90 minutes in the champions' 3-0 win over Sunderland on Saturday. He said: "The injury came at the wrong time with the new manager coming in. It is tough sometimes to force your way back in - I have experienced it before. "The manager is picking players he has called up, and relied on, during the summer and is probably thinking there is no need to oust them at the minute."